There are several things that distinguish you from your competitors, from your product or services to your vision and the way you present it. But what is the one thing that is common among all companies and yet different? They make a major contribution to your success by handling customer queries and providing handy solutions that help you retain your customers. Service representatives are often your company’s first point of contact so it is imperative that your customers have a good experience. But how exactly would you achieve it? One way to do so is by ensuring your support mavens can provide prompt and relevant responses. And yes, your support engineers can surely use some additional help to deliver lightning-fast case resolutions. In an attempt to find a solution to their predicament, troubled customers try a host of things like searching the problem on the community, taking help from a chatbot, and finally going to a support agent. And if your agent provides them with a document/solution they have already tried, you risk annoying them to their very limits and fueling customer attrition. You can avert such situations by empowering your support professionals with an insight into customer history. It will help them see everything the user has already tried and provide a better solution. An AI-powered cognitive search provides rich insights into complete visitor journey and helps enhance customer experience. Finding the quickest and most effective solution can be a daunting task for your service representatives. When accessing content spread across communities, knowledge-bases, websites, and blogs, the constant switching and searching not only reduces the speed of your employees but also brings down their motivation. You can make the whole experience less strenuous for your support wing by providing a solution that can scour multiple on-premises and cloud sources. With this, you enable them to access content residing outside Salesforce without having to leave the Salesforce Console. As a result, the average resolution time improves and your employees stay happy. Nothing disappoints customers more than having to wait for a response from your service reps. Even your support agents want to quickly send out an appropriate first response, but sometimes it can be a bit intimidating, especially for the new members of the team. In such scenarios, your agents need help to accelerate the whole process from understanding the query to providing its resolution. 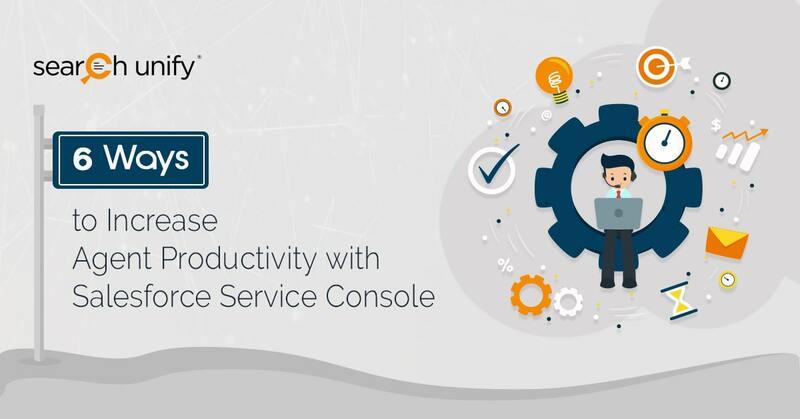 A self-evolving search solution integrated with your support console can help. It uses machine learning to analyze past cases as well as agents’ responses to suggest a suitable reply for the case that has just come. If the agent feels the response is relevant, he/she can send it right away! Sometimes, your product can develop an issue leading to a huge volume of similar cases. It is simply underwhelming for your support reps to keep providing the same response over and over again. 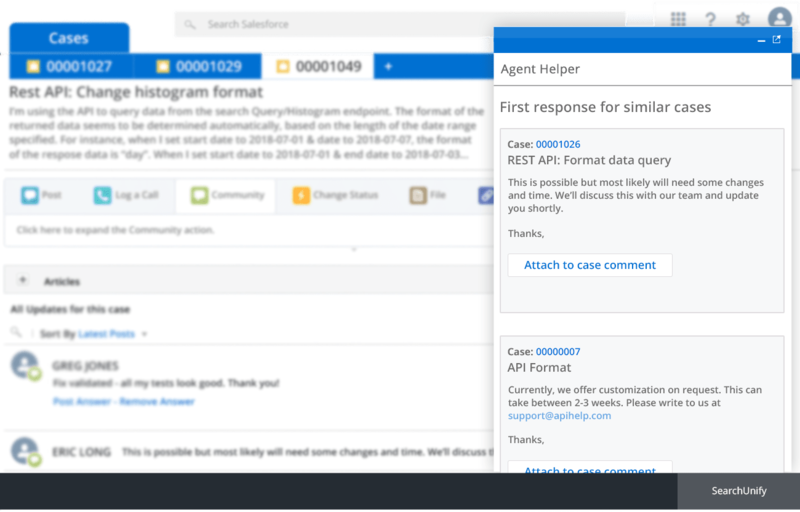 An intelligent solution is to empower your agents with automated responses for recurring cases. By tapping on machine learning and AI, the cognitive engine analyzes and learns from the existing case patterns to deliver a case-resolving response at the press of a button. In addition to taking the burden off your support agents, this also ensures the agitated customers get help as and when they need it. You can’t manage what you can’t measure. Therefore, dashboards are a support manager’s best friend. They provide a bird’s eye view of every agents’ productivity. Having an insight into resolved cases and resolution time, the manager can help enhance agent efficiency and ensure they are making the most out of knowledge sources to provide consistent support globally. With enough data on failed conversions and searches without result, they can effectively fill the gap that exists in the knowledge base articles. Last but not least, how about enhancing the search experience of support representatives leading to apt solutions to customer queries? You can prioritize one content repository over the other to ensure meaningful content is always at the top. Hence, you can make your support agents access relevant content faster by helping them narrow down their search using facets and filters. All said and done, how do you achieve all these goals? The answer is with a smart AI-driven cognitive search. It imbibes everything you need to elevate your support console for enticing customer experience. Want to know how? Request a demo or visit this page.